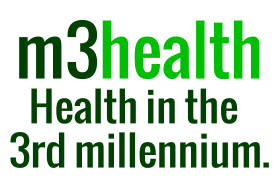 The convenors of m3health represent a range of disciplines including health, computing, medical science and sociology. The practitioners of these disciplines draw upon many years of experience to assist them in formulating the m3health program for recovery and health. Your usual medical attendant completes the team assembled to assist you. m3health believes that the new millennium requires new ways at looking at health. m3health believes that optimal health is achieved by the patient playing his part in both his recovery from disease and the maintenance of his own health. m3health sells no products, potions, drugs, remedies or medicaments. Nor does it advocate any system of medicine, orthodox or alternative. It has no religious affiliations and does not recommend individual practitioners. It receives no advertising revenue from any source. This enables m3health to make available health programs based solely upon the health needs of its subscribers. m3health focuses on helping people help themselves. Anonymity for both m3health convenors and m3health participants is maintained for the benefit of both, and for the maintenance of the relationship between participants and their own doctors. The website m3health.com is operated by Runfox Pty Ltd.